The new two-step, one-bottle bonding system. The new fifth-generation bonding system is based on modern nanofillers. GLUMA 2Bond produce excellent adhesion to the enamel and the dentine, as well as an optimal marginal sealing. 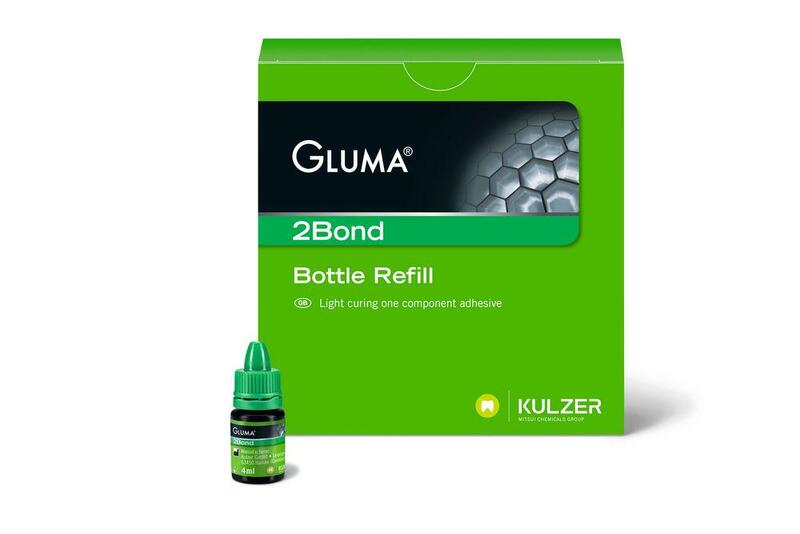 Furthermore, GLUMA 2Bond contains the GLUMA Desensitiser, a time-tested, successful glutardialdehyde product. GLUMA 2Bond is ideal for sensitive patients or the desensitization of hypersensitive areas. after the etching with GLUMA Etch and following the rinsing, only one layer of GLUMA 2Bond has to be applied. A time-consuming agitation is not necessary. Easy air-drying produces the effective cross-linking of adhesive and dental surfaces. Because of its new formula and special viscosity, GLUMA 2Bond remains stationary on the tooth. The result is a homogeneous, glossy layer on the enamel and the dentine  the guarantee for an excellent, durable restoration.